-Amidah Brimah registered the biggest standing reach here with a mark of 9'3.5 thanks in large part to his 7'6.5 wingspan as he stands 6'10.75 in shoes. A highly regarded prospect earlier on in his college career, Brimah performed well here, scoring a surprising 21 points per-40 (71% 2P%), and remains one of the more intriguing physical specimens among big men in the senior class. His standing reach and wingspan would have both been the second longest at last year's NBA Combine, and will make him someone NBA teams will want to look more closely at despite his poor senior season. Coming off a national championship in 2013-2014, the Connecticut Huskies took an expected step back in 2014-2015. They finished the season fifth in the American Athletic Conference with a 10-8 conference record and received a bid to the NIT, where they lost in the first round to Arizona State. One bright spot for UConn in an otherwise down year was the continued emergence of Amida Brimah, a junior center from Ghana who emerged as one of the best defensive players in the nation. At 7'0 and with a reported 7'6 wingspan, Brimah is as long and imposing a defensive force as you'll find at the collegiate level. However, at just 230 pounds, he'll need to continue to add strength in order to competently defend big men at the NBA level, the extent to which he'll be able to do so will play a major role in his evaluation. Still, having only played basketball for about five years, Brimah has made significant strides  showing encouraging progress as a sophomore on both ends. Brimah is a highly efficient  albeit limited  offensive player. Of his 184 field goal attempts last season, 176 came inside the paint. Still, his consistency makes him a valuable weapon: he shot 77.5% on 102 field goal attempts around the basket last season. He is quick off his feet, and when able to corral a pass (not always a give-in), is a terrific finisher around the basket thanks to his length when spoon-fed in open spaces. Brimah's post game is a work in progress. While he actually made more post ups as a sophomore than he even attempted as a freshman, Brimah still converted at a meager 25-of-59 rate from the post (42.4%), and looks unlikely to ever emerge as much of a consistent threat here against higher level competition. Brimah also got to the free throw line at a decent rate (4.5 attempts per 40 minutes), relative to his low usage. He's passable at the line, converting on 67-of-103 free throw attempts last season (65%), though he'll need to work to improve in that area this season. Brimah has shown some minor sparks of potential as a mid-range shooter in his two years at UConn, and the improvement he made from the free throw line as a sophomore (up from 57%) leaves some room for optimism that he'll be able to develop this part of his game in time. He showed some flashes in this area at the adidas Nations camp this summer, which could be a nice tool he can continue to develop to improve his role-player status as a pro. Brimah runs the floor exceptionally well for a player of his size, making him an elite transition player on offense (he shot 14-for-15 in transition possessions last year). He takes massive strides, covering ground at a fast rate for a seven-footer. Brimah's height, length, timing and mobility make him is one of the best defenders at the college level. Brimah led all draft prospects with 5.3 blocks per 40 minutes and led the country with a 15.0% block percentage. He moves fairly well but his lateral movement outside of the paint is still a work in progress. Brimah's biggest weakness early in his college career was his inability to defend without fouling. As a freshman, Brimah committed 7.1 fouls per 40 minutes. His weak base makes him susceptible to giving up deep seals to opposing big men in the paint. Regardless, as a sophomore, Brimah compensated for lack of lower body strength with smarter hand positioning and better timing. His foul rate dropped to a reasonable 4.3 fouls per 40 as a sophomore, while his rim protection remained elite. While he has the potential to become a strong pick-and-roll defender, he needs to improve on his angles when guarding after switches  as he gets beat off the dribble too often for a player with his length. His wingspan makes him a capable defender on close outs, though he's still poor at getting out to defend perimeter shooters. Overall, Brimah will catch NBA radars because of his length and shot blocking abilities. He will need to expand his offensive game somewhat and continue to develop his strength to comfortably bang with physical centers in the NBA. Still, considering his encouraging development from freshman to sophomore year, it's fair to assume Brimah is still evolving. According to him, he's only been playing basketball for five years. With his enormous defensive potential, he should remain an intriguing prospect to watch all season. 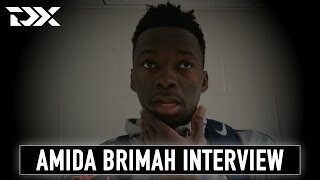 An interview with Connecticut center Amida Brimah at the 2015 adidas Nations in Los Angeles.